Last week, we camped at Faver-Dykes State Park. We arrived at the park late Friday after several hours of heavy storms. The roadways within the park are not paved and we questioned our sanity pulling our 33ft travel trailer along these very wet dirt roads. Fortunately, they were well maintained so we made it to our campsite without issue. There was just enough daylight left for backing in and unhooking, the process was made more frustrating than necessary by the incessant mosquitos. With trees dripping moisture and mosquitos buzzing all around us, we could easily imagine ourselves in a rainforest in another country. After getting all set up, outside areas included, we took refuge inside from the bugs and humidity. The next morning, we left first thing to head to St. Augustine; we had no desire to hang around at camp. We stopped for breakfast and then went to the Castillo de San Marcos. It's the oldest masonry fort in the United States. The longevity of the fort is due in part to the construction material, coquina. 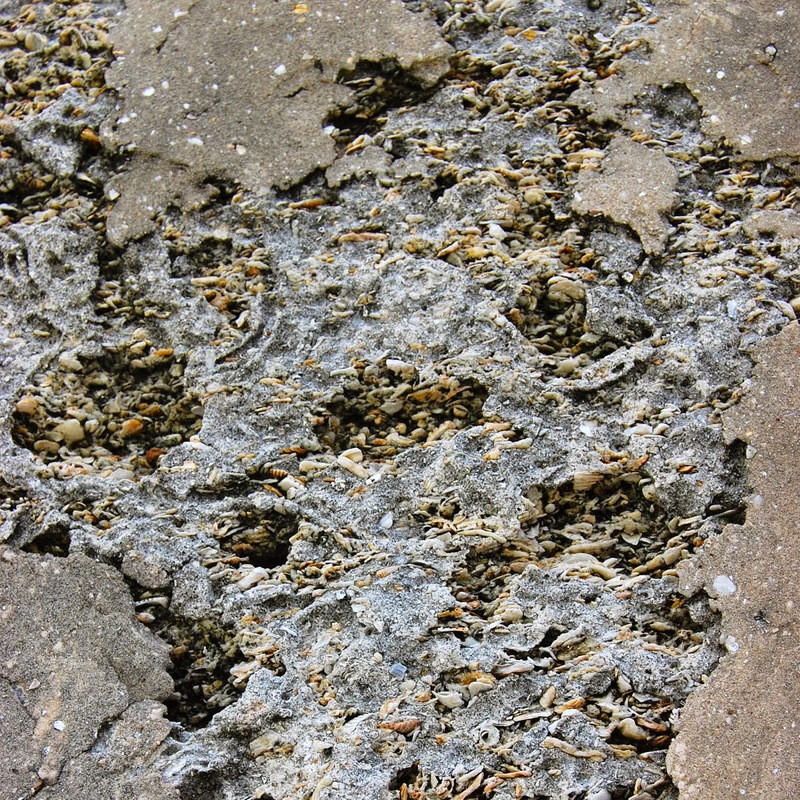 Coquina is a type of limestone and this particular type of coquina is made primarily of small clam shells. This material is very porous and allowed the fort to essential absorb enemy cannonballs instead of shattering under the impact. We have visited several other forts in our travels (most never made it on the blog) so it was nice to include this icon on our list. We strolled along the water to the marina where we grabbed some lunch at the Santa Maria Restaurant - my husband remembered eating there as a child with his family and feeding the fish through the little trap doors. It was in need of some updating, but it's easy to see how it's become one of St. Augustine's landmarks. The kids were overjoyed at feeding the fish and having their own favorite food to eat. Much gratified by her chicken nuggets and fries, my 6-year old daughter pronounced the day as the best ever and it wasn't over yet. While at the marina, we also got a closer look at some of the more novel boats. One was a replica pirate ship called the Black Raven. It's essentially an ocean going stage for a pirate show. We took note of rates and times for a future special occasion - the kids were very interested and would likely really enjoy it. The Black Raven should feel right at home in the oldest port in America. Pirates, after all, were no strangers to St. Augustine. The "Old City" has a long sordid history that includes being burned twice by pirates, once by Sir Francis Drake who the Spanish called "The Dragon." We learned a lot about pirates at St. Augustine's Pirate and Treasure Museum. It was a great way to end our day. This museum is unique in that it houses one of the largest hordes of authentic pirate related artifacts anywhere. From a parent's perspective this museum gets two thumbs up, because they manage to entertain the kids long enough for parents to actually have time to take in the displays for themselves. While the kids were working on their treasure hunt, I got to read about Sir Francis Drake and note that the Jolly Roger hanging behind the glass was one of only two authentic flags of the sort known to exist. We had a lovely day in town (despite the heat) and decided to head back to camp for dinner. It turned out to be a very pleasant evening once we got all the citronella candles and Tiki torches lit. We took a little hike on the nature trail as well and sighted an armadillo scrounging for his dinner - if you are quiet they will walk right up to you as you can see in the video. For a minute there, I thought he was going to crawl over my feet. The next day we tried a little fishing in the brackish waters of Pellicer Creek before heading home. 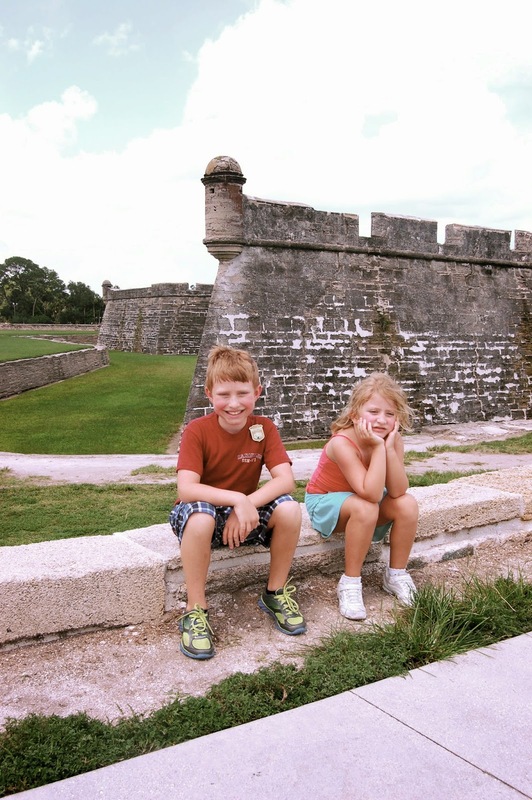 St. Augustine - Family Vacation Awesomeness!